Italian, Doric and Urdu are among languages that will be used to take affirmations as Holyrood resumes business. 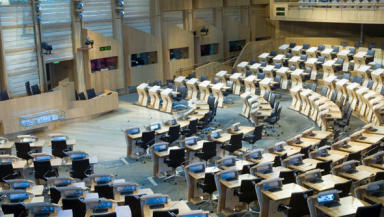 Six different languages are to be used by Scottish National Party MSPs as they take their Holyrood seats. Alongside English, MSPs will use Urdu, Gaelic, Scots, Italian and Doric to take their oaths or affirmations. Newly-elected Glasgow MSP Humza Yousaf will take his oath in Urdu and English, reflecting his Scottish-Pakistani identity. He will also wear a traditional garment called a sherwani with a tartan plaid. Rob Gibson, Dave Thompson, Michael Russell and Alasdair Allan, who all have Highlands and Islands constituencies, will use Gaelic, as will list MSP John Finnie. Michael Russell and Dave Thompson will also use Scots for their oaths. Aberdeen South and North Kincardine MSP Maureen Watt will deliver her oath in English and Doric as will newly elected North East MSP Mark McDonald. Edinburgh Central MSP Marco Biagi is to take his affirmation in English and Italian. SNP Group Convener Gil Paterson said: "We have a wide range of cultures, roots and linguistic ties in this 69 strong group of SNP MSPs and as our MSPs take their seats they are highlighting just some of the different cultures the SNP represents across Scotland." Glasgow MSP Humza Yousaf said: "I’m proud like many in Scotland of my Scottish – Pakistani identity and by taking the oath in Urdu and English and mixing traditional dress from both cultures I hope to take a further step toward cementing the Scottish-Pakistani identity in Parliament." The Doric oath to be used by Maureen Watt is: "I depone aat I wull be leal and bear ae full alleadgance tae her majesty Queen Elizabeth her airs an ony fa come aifter her anent the law. Sae help me God." And the Gaelic Oath to be given by Alasdair Allan reads: "Tha mise a’ mionnachadh gum bi mi dìleas agus fìor umhail do a Mòrachd a’ Bhànrigh Ealasaid, a h-oighreachan agus a tànaistean, a-rèir an lagh, mar sin cuidich mi a Dhè."